Chelsea Wolfe stripped most of the electric instrumentation from her doom-folk sound for this remarkable record, which finds all the terror it needs in heart-splitting vocals and empty space. The electric touches to Chelsea Wolfe’s doom-folk sound are nice window-dressing, but as Unknown Rooms shows, they’re not necessary — perhaps even a distraction — from conveying the gothic folk sound Wolfe built on her previous two albums. 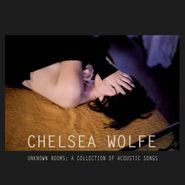 Stripped of nearly all else except acoustic guitar, exquisite violin and viola, and Wolfe’s arresting voice, Unknown Rooms is Wolfe’s strongest statement yet. In “The Way We Used To,” which Wolfe’s voice expresses the soulfulness always lurking in the shadows of her sound, harmonizing a simple vibrato vocal line to great effect as Wolfe’s voice gets higher (and more emotional) than she’s ever shown before. “Spinning Centers” takes a similar cue, using singsongy vocals in an ever-so-unsettling backdrop to create a beautiful kind of witchy music that suggests something ancient and beyond simple explanation. A song title like “Appalachia” would imply an exercise in Appalachian folk reverence, but in practice the song’s almost harsh, trudging nature makes it into a woodsy elegy. Her voice and delivery occasionally draw comparison to PJ Harvey, a tough comparison that could drag her down, but Wolfe ensures her music is distinctive enough that she’s considered more than merely a Harvey disciple. The distinctive quality of the incantations in “Boyfriend” and mandolin-esque vocals of “Our Work Was Good” alone make Wolfe sound like the leader of her own cult, one which will surely grow with the release of this excellent work.